Lately I've been really into the whole monthly goals thing because looking at the big picture can be pretty overwhelming. I'd much rather concentrate on 30 days to accomplish a goal then, say, 365 days. And to be quite frank, I've forgotten most of the goals I made back in January anyway. So here are my goals for September. 1. To really crack down on my training for S2S: This one is a given since the race is this month so I really don't have a choice either way. My goal is to ride 3 to 4 times a week, mostly to keep my muscles toned and to get saddle time in, because those seats are NOT comfortable and takes a lot of getting used to. 2. To complete one book this month: I love to read but I feel like over the past few months I've started a book then got extremely busy so by the time I came back to it weeks later I didn't know what was going on so I'd just start on something else. I really want to find the time to sit down and read at least half an hour each day. If I can watch mind-numbing t.v. (not that there is anything wrong with that) I can definitely make time to read a little each day. 3. To spend more quality time with the hubby: Note the use of quality in that sentence. My husband and I have worked together since we've known each other so we were together practically all the time. Now that he's switched careers (Friday was his official last day) we don't have the luxury of eating lunch together or walking over to see each other whenever we want. So I'm planning on any time spent with him as OUR time, meaning no phones, e-mails, or other distractions. Are you reading this hubby, because this applies to you too! 5. Last, finally start that gratitude journal: I recently wrote a post on gratitude and how important I feel it is to do this on the daily. I feel like it shouldn't be something you have to think about, but for most of us it is, and like anything else, until we do it enough it takes a lot of work. Starting a gratitude journal where I note one thing I'm grateful for each day definitely pushes me in the right direction! Do you guys like to make monthly, yearly, or even weekly goals? What works for you? Let me know in the comments below! These are great goals! Mine is to get my healthy lifestyle back on track BEFORE the holidays get here, otherwise I am doomed lol! Great goals! I especially like the idea of trying one new recipe a week. Cooking new things and trying new things to eat is always one of my goals. I always make informal goals that I strive to achieve, but it helps to write them down or blog about them to keep yourself accountable. Good luck achieving these this month and have a lovely week! 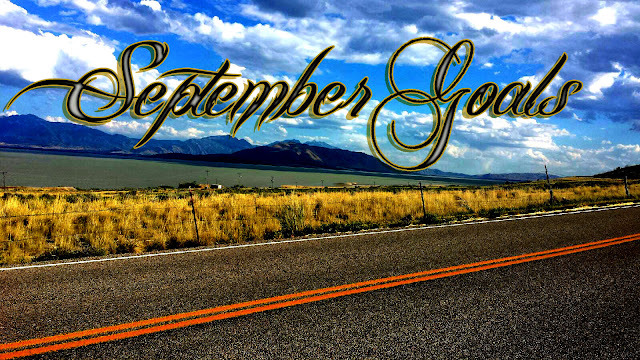 I love your September goals hon, and couldn't agree more that it is so much better to set little (or big) goals for 30 days. So much easier to stick to them! I love your goal about spending quality time with hubby. Putting those phones away and enjoying each other's company is essential and nothing can come close to it (not even twitter chats haha). Hope you stick to your goals! Let me know how you are getting on with them.